You may remember that last summer we launched our permanent exhibition at the Joe Cornish Gallery. We've had some wonderful feedback and have been working hard behind the scenes to launch the next exhibition. With the Meeting of Minds Conference, Christmas and a house move to plan for, it's been a juggling act for us, but with the support of Adam Richardson and Jo Rose, we are delighted to announce the date of the next exhibition at the Joe Cornish Gallery. Working with Adam and Jo, we wanted our second exhibition at the gallery to show what an influence Joe Cornish and the gallery have been on landscape photography in the UK. Going back through our featured photographers and other interviews (and talks at the conference), the common theme with a lot of photographers was who they drew inspiration from when they were defining their voice and style of photography. Joe Cornish's book 'First Light' was one of the books that was cited many times over as an inspiration for those photographers' work, so it felt right to use this as a theme of the next exhibition. Working with the team at the gallery we have curated an exhibition by photographers who have been featured in the magazine or who have been part of the conference, that have mentioned First Light as a direct influence. On Saturday 4th March 2017 we launched our second exhibition 'First Light Inspiration' and held a panel discussion with Joe Cornish, Tim Parkin and the exhibiting photographers to discuss the influence and inspiration of First Light (click here for our review of First Light) on their photography and the wider conversation around influence and inspiration in their creativity. 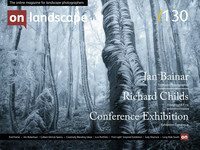 View our previous exhibition on our featured photographers which was launched in July 2016.